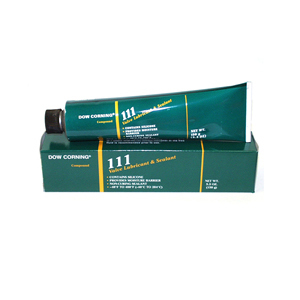 Dow Corning 111 1204K32 is a heavy-consistency, translucent grease like silicone paste. A temperature range of 40 to 400 degrees F enables this lubricant to lubricate plug, sanitary, gate, ball, butterfly and automated valves. An excellent lubricant for pump packings, rubber and plastic O-rings, sealing vacuum and pressure systems and it is a damping medium for dash pots in electrical equipment. Package of (2) two Dow Corning 111 tubes.